Acknowledged author Paul Krugman wrote Macroeconomics comprising 656 pages back in 2017. Textbook and etextbook are published under ISBN 1319098754 and 9781319098759. Since then Macroeconomics textbook received total rating of 3.5 stars and was available to sell back to BooksRun online for the top buyback price of $63.33 or rent at the marketplace. 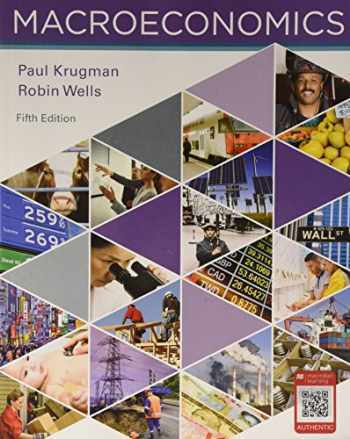 Paul Krugman and Robin Wells’ signature storytelling style helps readers understand how economic concepts play out in our world. The new edition, revised and enhanced throughout, now offers holistic digital learning tools as part of SaplingPlus, a complete, integrated online learning system.This new edition is revised and enhanced throughout, including a much stronger array of superior online tools that are part of a complete, integrated online learning system.